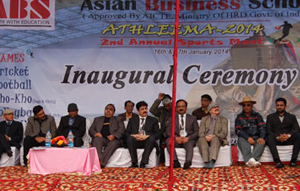 The participants were formally invited for the valedictory function on January 18, 2014 at the premises of Asian Business School. Over more than one lakh of cash prizes and gift vouchers were distributed along with trophies and medals by Prof. Sandeep Marwah, Mr Atul Wasan former member Indian cricket team, Mr Karl Bardosh reonwed Hollywood film maker, and Mr. B. K. Bose, Secretary, Indian sports and culture society. In the end Dr. Lalitya Vir Srivastava Director, ABS congratulated the winners with a promise that “Anthleema” will reach new heights in every coming year.